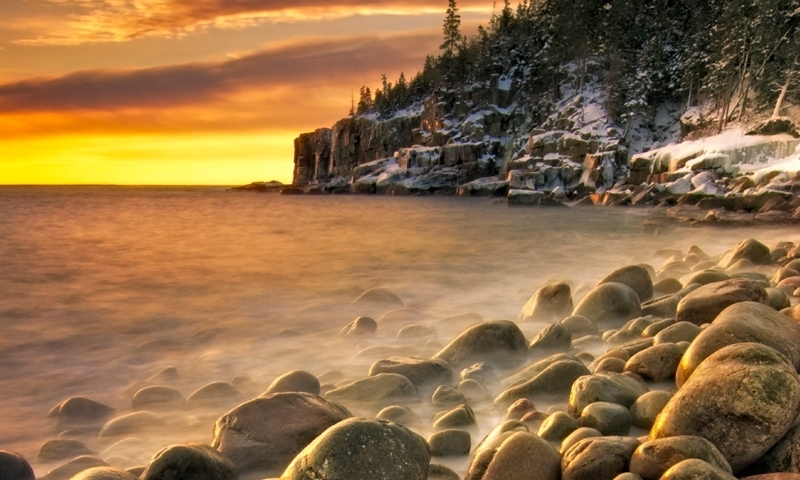 Winter Recreation in Acadia National Park includes snow shoeing, cross country skiing, ice fishing and even snowmobiling. During good weather, part of the park loop road remains open to car traffic, allowing access to the ocean vistas of Sand beach, Thunder Hole and Otter cliffs, free of charge. These are popular along the unplowed sections of the park loop road that are closed to car traffic and along the carriage paths. Hiking paths are often unsuitable for these activities due to uneven and dangerous terrain. Be aware that the park loop road is also used by snow mobiles. Snowmobiles are aloud on the seaside lane of the park loop section that is left open to motorized traffic. The plow will often leave this lane snowed in for snowmobiles. This only occurs in cases of substantial snow fall. It is best to drive the loop road to make sure the trail is covered fully in packed snow. The closed loop roads and fire roads are also open to snowmobiles. Carriage roads are generally closed except for a few connecting trails. These areas are shared by hikers, snowshoers and skiers so please be aware of other winter visitors. Dog sledding has been gaining in popularity as a winter sport and is permitted in these areas. Many Island lakes and ponds are popular ice skating and fishing spots when the thick ice sets in. Check with local towns and park services for regulations concerning ice fishing. For survivalist adventures, winter camping is available at Blackwoods Campground for free. Registration is required and specific camping guidelines must be followed. Contact the park service for more information.